She was born Joanna Jill Crockford in England in 1927. She knew she wanted to be an artist from a very early age and pursued her passion tirelessly. Determined to break away from the hard post-war years she borrowed money from her father and bought a one-way ticket on a freighter to visit a friend in South America. Travelling simply, with an atlas under one arm and her paints under the other, she set off to make her fortune as an artist and happily, on her very first night, fate would have it that she was introduced to a young bachelor, Jimmy Walker. The Caribbean, in the 1950’s, was an idyllic place for this young couple, setting out together, she the gifted artist, he the ambitious architect. Mum soon fell in love with the people and the culture, painting her surroundings yet unconsciously recording a lifestyle that is now, in places, slowly disappearing. … and my Mum still enjoys painting daily. 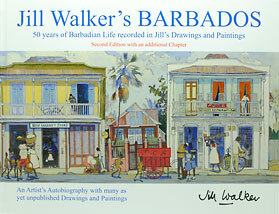 You can read more about my very special Mum and her inspirational story in her own words, sketches, drawings and paintings in, “Jill Walker’s Barbados”, her beautiful book, available here.